Friday October 31, 2014: 22 new birds of 9 species; 6 recaps. No new species. Bird of the day is White-throated Sparrow with six new bands. We thought today might be a good day because of the overnight northwest winds, but the birds leaving the north shore of Lake Ontario at dusk appeared to overshoot Rochester, continuing to at least the Pennsylvania border before a storm system dampened migration. Nevertheless we banded a handful of late migrants today including a Field Sparrow – the first one since the 19th of October. 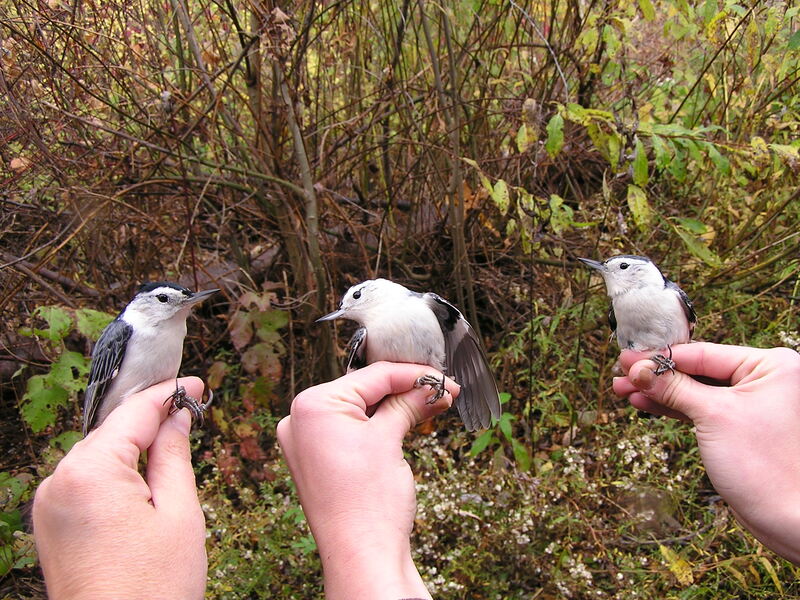 A trio of White-breasted Nuthatches was captured in the 90-aerial nets (panels 5, 6 and 7) all on the same net run. Three White-breasted Nuthatches. The end birds are both males, and the center bird is a female. The radar worsened throughout the morning, prompting us to close the nets early. Thursday October 30, 2014: 31 new birds of 9 species; 20 recaps. No new species. Bird of the day was Black-capped Chickadee with 9 new bands. We seem to have caught the tail end for the migration of many of our most common species, as the numbers of migrants are definitely dwindling. 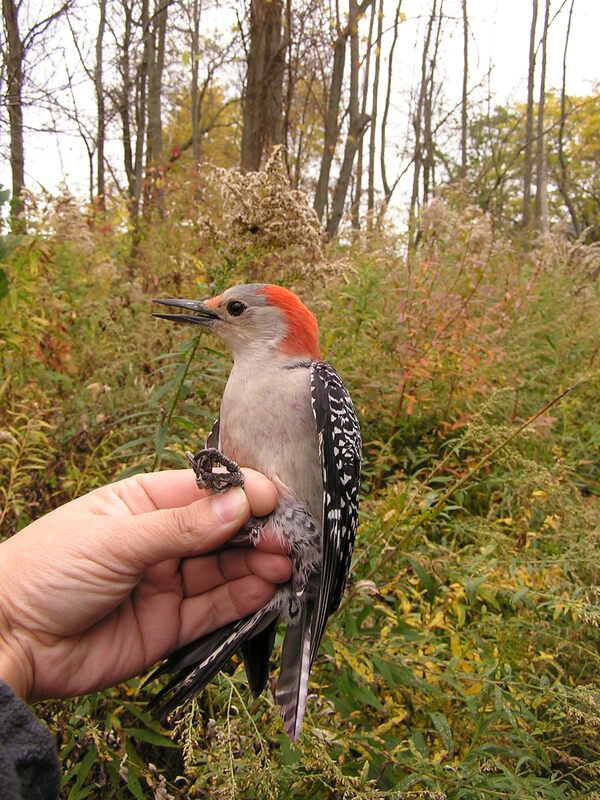 However, we appear to be capturing (or re-capturing) Downy Woodpeckers more frequently than we often do. Today, we processed three different Downies. Yesterday, we showed a photo of a second year Red-bellied Woodpecker who had replaced 4 outer primary coverts, which is a molt pattern typical not only in Red-bellies but also Downy and Hairy Woodpeckers. 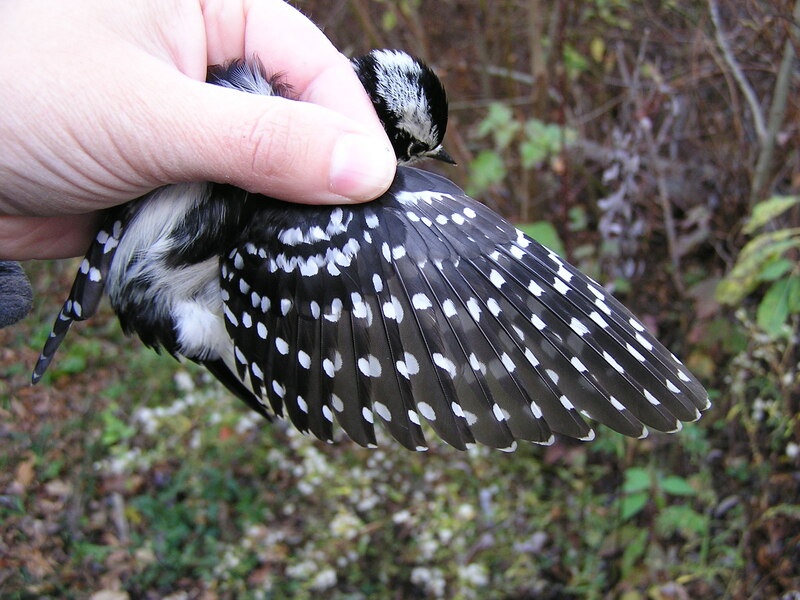 Today, our Downy Woodpeckers were all hatch-year birds. Notice how all the primary coverts are uniform and brownish, and that they contrast with the rest of the wing (which is black). This is a typical molt pattern for hatch year Downies. 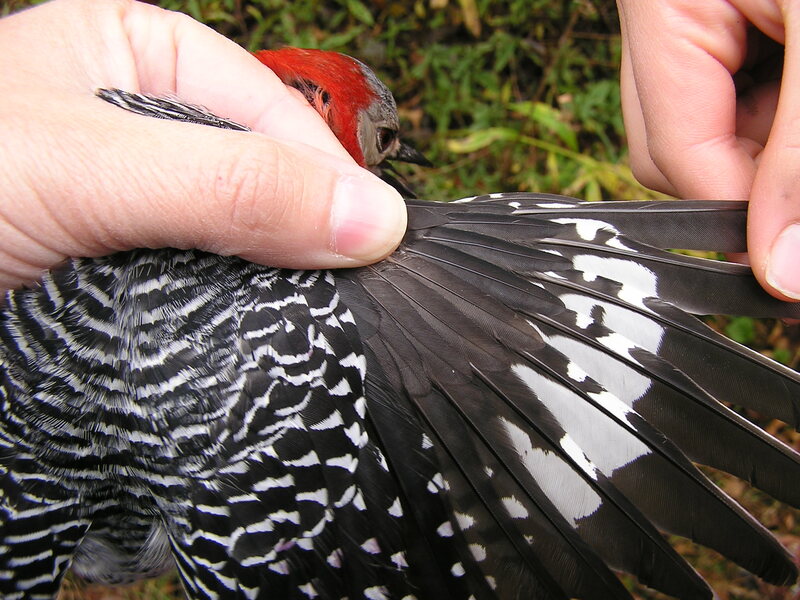 Because woodpeckers have more complicated molt patterns involving feathers that are retained for 2 calendar years, we are able to age them even into their third or after-third years. Hatch-year Downy Woodpecker showing retained juvenile primary coverts, and replaced formative plumage on the rest of the wing. Yesterday’s woodpecker had a reddish eye, typical of older birds. Today’s birds all had the brownish eyes typical of young birds. 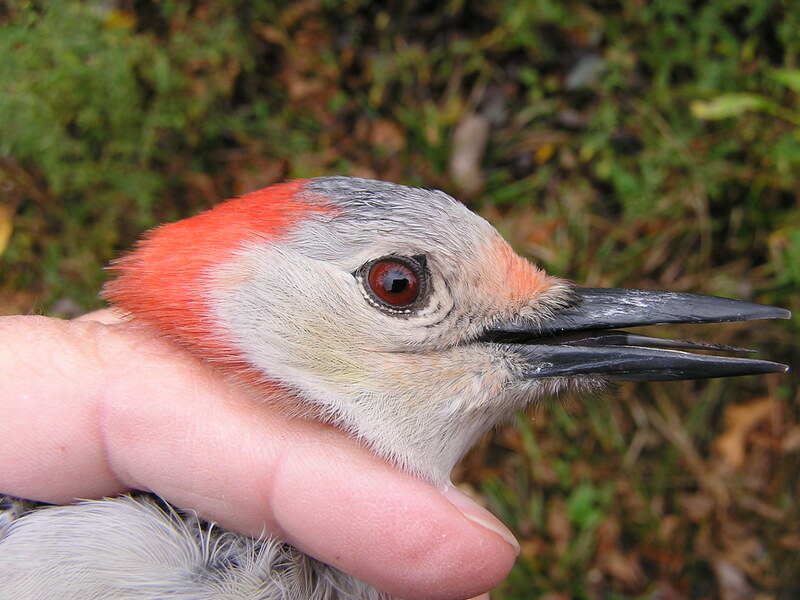 Changing eye-color (from brownish to reddish) is something many woodpecker species share as well. 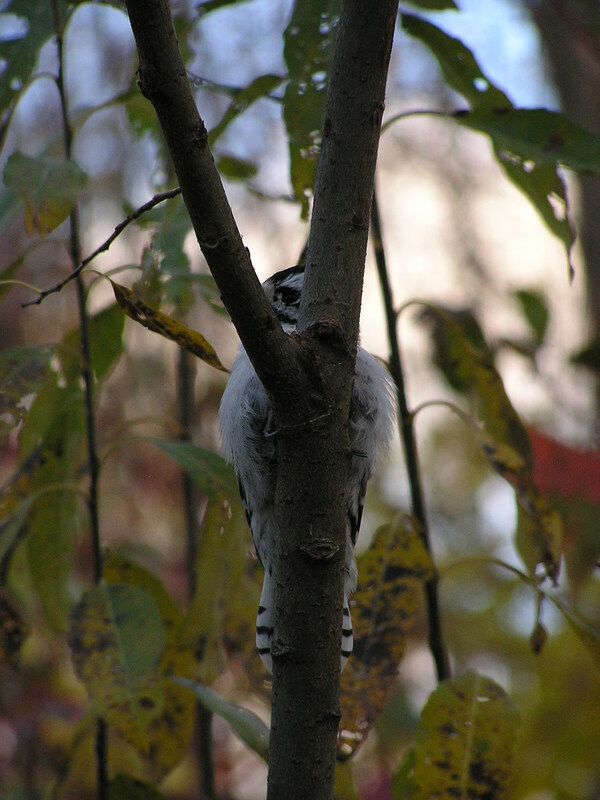 Hatch-year Downy Woodpecker. Notice the brown eye. Usually upon release, the Downy Woodpeckers fly to a nearby convenient tree to get their bearings. The young male below appears to be playing peek-a-boo from a nearby branch. Tuesday October 28, 2014: 40 new birds of 4 species; 11 recaps. No new species. Bird of the day: Black-capped Chickadee with 26 new bands. A merry band of volunteers gathered at BBBO this morning hoping to be regaled with flocks of siskins and goldfinches, but we were thwarted. The swirling hoards of yesterday were gone, to be replaced with . . . chickadees and cardinals. We banded five new Northern Cardinals today, which is the highest single-day total this fall. 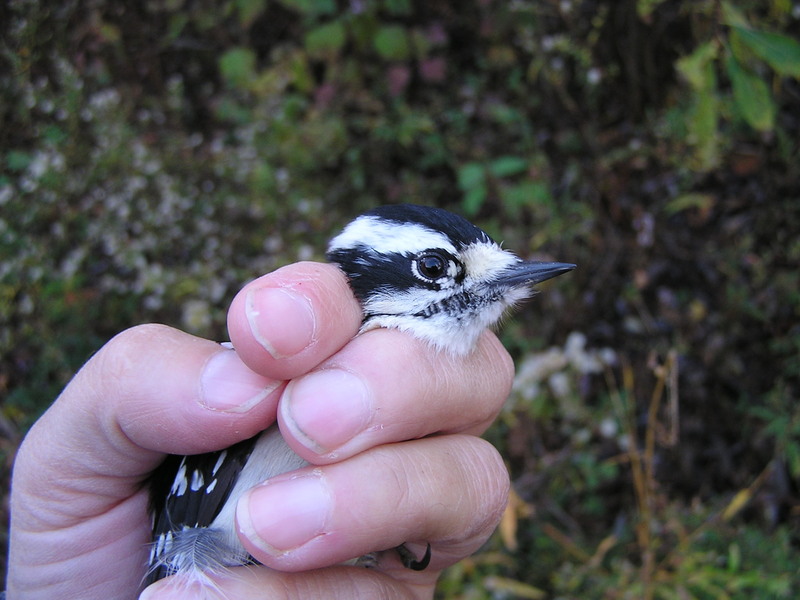 We also banded 26 new Black-capped Chickadees, again our highest single-day total this fall. Betsy stopped by to pick up the season’s datasheets, Sue and Meghan cleaned up the lab table, and we put all of the outdoor furniture away in preparation for winter. We’ll only be banding about three more days – make certain to stop out before we close! Not your ordinary day . . .
Andrea Patterson	Fall Banding	Comments Off on Not your ordinary day . . .
Monday October 27, 2014: 90 new birds of 13 species; 25 recaps. Bird of the day was American Goldfinch with 52 new bands. One new species for the season (see below). We were closed Sunday due to the high winds . . . and what a difference a day makes! While Monday morning started out chilly, it quickly warmed to a sunny, nearly windless, perfect fall day. The leaves crunched beneath our feet as we walked the trails checking nets, and the birds chirped and twittered overhead. Flyovers by two Snow Buntings hinted at the winter to come, but in all other ways autumn was on perfect display. The Allyn’s Creek Garden Club held their monthly meeting in the EWB Education Room, and they were treated to views of Golden-crowned Kinglets, Slate-colored Juncos, and one young Yellow-shafted Flicker. They saw a brief presentation, toured the net lanes, and visited the habitat work they have done on the east end of the field. 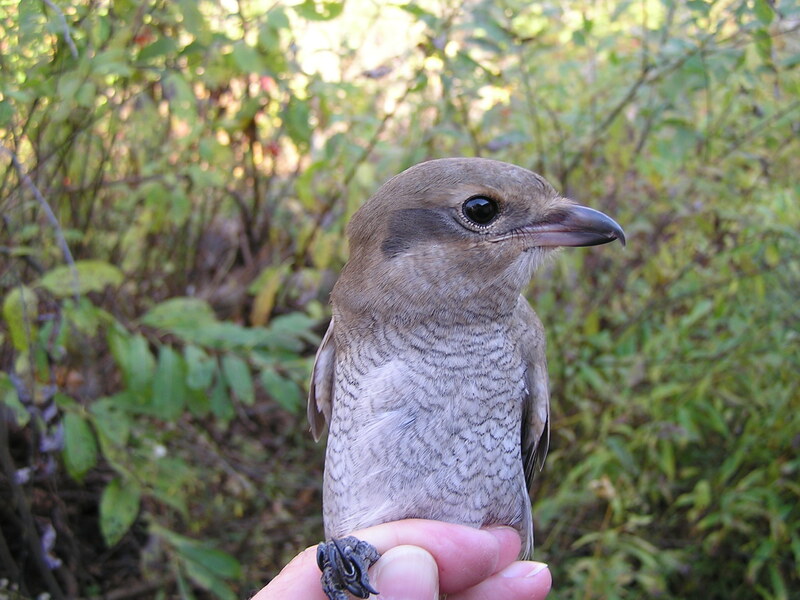 This hatch year Northern Shrike was netted in the top panel of one of our aerial nets, was extracted (safely) but David, and banded (also safely) by Greg. Shrikes have razor sharp bills, and they can easily slash a finger. This bird was too young to do much damage, so we risked a quick photo before we let him go. Saturday October 25, 2014: 106 new birds of 9 species; 12 recaps. No new species. Bird of the day was Pine Siskin with 72 new bands, followed by American Goldfinch with 10 new bands. Black-capped Chickadee inches up to 9 new bands. The first two runs of the day were fairly slow and ordinary, but during the 1.5 hour net check, Gayle called back to the station for reinforcements at the back aerials. A flock of Pine Siskins and American Goldfinches (and one confused Chickadee) peppered net 70 and about five vertical feet of net 60. Gayle and Jenna reported that the “leader” of the finch flock sat perched on top of the net, perhaps scolding his wayward followers . . . or perhaps trying to call more in to join the fun. Once we had all the finches back inside the station (minus the leader, who was never caught), they were generally quiet as they waited their turns to be banded. Every now and then, one bird would start chattering and others would join in. We laughed that they were probably staging a mutiny, deposing their “leader”, and electing a new Supreme Siskin. It must have worked, because they managed to stay out of our nets the rest of the day. In fact, of the 118 birds we handled today, 70% of them were caught on that net check, and 65% (of the 118) were caught in nets 60 and 70. We were thankful that our skilled staff worked quickly, carefully, and without panic to make the day a thorough success! Andrea Patterson	Fall Banding	Comments Off on Are they building?? ?